Home > Comet Clutches and Parts > Comet 216826C. 90D Driven for PUG > Comet 216836A Reverse Wind Spring for 90D Secondary Pulley. > Comet 212299A. Comet Industries 90D Series Driven Clutch. Comet OEM Part 212299-A. Comet 212299A. Comet Industries 90D Series Driven Clutch. Specs: 9.91” Diameter, 3/4” Bore, 3/16” Key, 1-3/16” TW Belt. 212299-A Comet Industries 90D Duster Series Driven/Secondary Clutch. Use ONLY with Comet Industries 94C “Duster”, Comet 780, or other Comet 1-3/16” Belt torque converter drive unit. Uses heavy duty Brown 212102A Comet Cam Spring. Substitutes for 216826C PUG Driven. Specs: 9.91” Diameter, 1” Bore, 1/4” Key, 1-1/4” TW Belt. Comet 212102A "BROWN" Cam Spring for Comet Industries 46D/90D/100D Driven Clutch. 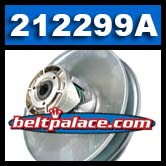 Comet 212102A - "BROWN" Cam Spring for Comet Industries 46D/90D/100D Driven Clutch. Comet Industries 212102-A. Comet Industries part #204332A 3-Pack of “Black” non-snap Insert buttons replace worn out, lost or broken buttons on Comet 20 Series, 30 Series, and TAV Go Karts. Same as MANCO GO CART'S Lower Torque Drive Buttons "Manco 6804". Kenbar 300-015A models. Comet 300821-C Drive Clutch (Primary). Comet Industries 780 Series 300821C Spec: 1" Bore, Uses 88g Weights and YELLOW spring kit to achieve approx. 1850RPM Engagement.